At an April 4 Capitol press conference, Rep. Saylor announced he will join two Monroe County lawmakers in a lawsuit to force a change in the way school districts are funded at the state level because the funding formula is unconstitutional. Primarily, it shortchanges growing school districts, forcing constant increases in property taxes to make up the difference. "There is a moral limit to the level of taxation and that limit was reached a long time ago,” Saylor said. 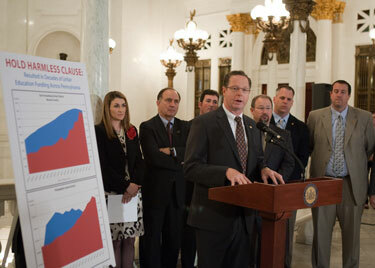 HARRISBURG – In another facet of his continuing efforts to fight the inequities of school property taxes, House Majority Whip Stan Saylor (R-York) today said he will join two Monroe County lawmakers in a lawsuit to force a change in the way school districts are funded at the state level. Saylor accompanied Reps. Mario Scavello (R-Monroe) and Rosemary M. Brown (R-Monroe/Pike) at a Capitol press conference today to detail why they are planning to file a lawsuit in Commonwealth Court to have the state’s 1991 funding formula ruled unconstitutional. In particular, the 20-year-old “hold harmless” provision in the state Education Code states that no school district can receive less state funding than the year before and is based on census results from 1991. Because of this, counties which have rapidly growing school districts, such as York, receive far less funding than counties with school districts where student populations are declining, static, or growing very slowly. A long-time supporter of eliminating school property taxes, Saylor is also an original co-sponsor of House Bill 2300, which would amend the Pennsylvania Constitution to raise the homestead property tax exemption from 50 percent to 100 percent of the home’s assessed value. He also joined Rep. Jim Cox (R-Berks) this week to unveil of House Bill 1776, which would completely eliminate property taxes in Pennsylvania. Saylor is also a co-sponsor of House Bill 2230, authored by Rep. Seth Grove (R-York), which would allow voters to decide regionally whether to eliminate school property taxes and replace them with a more equitable form of funding public education.